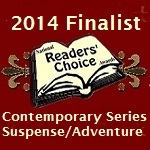 VANISHED is a finalist in the National Reader’s Choice Awards in the Contemporary Series Suspense/Adventure category! Winners will be announced at the RWA National convention in NY in July. YIPPEE!! Suz will be signing books for the 2015 “Readers for Life” Literacy Autographing at the RWA National Conference in NYC. PLACE: the New York Marriott Marquis. Suz will be attending the 10th annual BUNS & ROSES Tea to support Adult literacy in the Richardson, TX area.